If you are someone who is dealing with weight gain (especially abdominal area) or maybe you have been told you are diabetic or at risk for developing diabetes- you probably know you need reduce how much sugar and carbohydrates you are eating. We all think of sugar sources are cookies, baked goods, breads, and chips etc... but guess what? 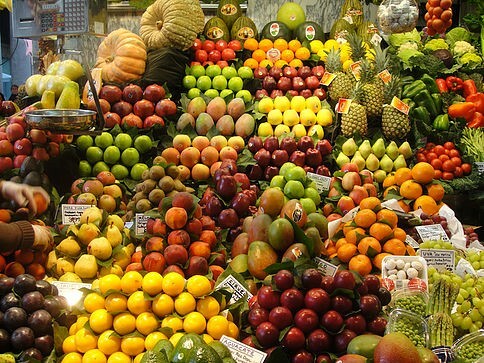 Fruits are loaded with sugar- they are nature's dessert! Is it better than eating a slice of cake? Sure...fruits have fiber that help stabilize your blood sugar and essential vitamins good for your health, but all the sugars you eat do add up. If you are trying to eat a healthier diet, it is great to eat fruit as a treat and focus on increasing vegetables in your diet. They go a long way as far as filling you up with heart-healthy fiber and they have lower amounts of sugar and carbohydrates. The more carbohydrates/sugar are in the food you are eating, the more insulin your body releases to drive it into your muscles, liver and fat cells. People with metabolic problems like high cholesterol, abdominal weight, pre-diabetes and diabetes have more difficulty handling sugars in their food, and therefore need to eat less of it to maintain health. For example, 1 cup raw spinach has 1 gram of net carbohydrates. (Net carbohydrates are Total carbohydrates minus the fiber). A medium sized apple has 18 net grams of carbohydrates. And all fruit is not created equal! So, if you enjoy fruit and want to eat more of it, focus on the options to the top of this list. You will be able to enjoy more of it while getting the health benefits of fiber and essential vitamins. Try adding greek yogurt, dark chocolate or real whipped cream for a sweet, filling treat!